Today Congress approved, and President George W. Bush signed, a federal economic recovery bill authorizing the U.S. Treasury to invest of up to $700 billion to calm markets and restore credit availability. 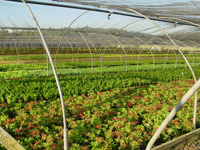 And according to OAN Executive Director John Aguirre, that’s good news for Oregon nurseries. Aguirre also praised the move for the positive impact it will have on the broader economy.